We sure are feeling the hoop mania. Are you too? This season will have you jumping through hoops. Figuratively, of course! And today, after much research and consideration we have got you the accessory that can easily be deemed the accessory trend of 2018 (also one, that we are obsessed with). Yes, you guessed right. We're talking about hoops. Giving you some fashion history, this jewellery style has had some major moments back in the day. And we're talking about the '60s and then the '90s. Be it simple gold hoops or neon ones and whatnot, hoops are increasingly been worn by our celebrities in various forms. We wouldn't hesitate to even call it a go-to accessory for our B-Town divas. Hoops are a fail-safe way to elevate even the most basic of your looks, or give that athleisure outfit you love a cool update. They can even be donned with traditional outfits to give them a modern twist. Now, just to give you'll a 101 as to how to buy the right hoops, make sure that you buy the correct size of hoops according to your face-type. There’s one for everyone out there. Don’t believe us? 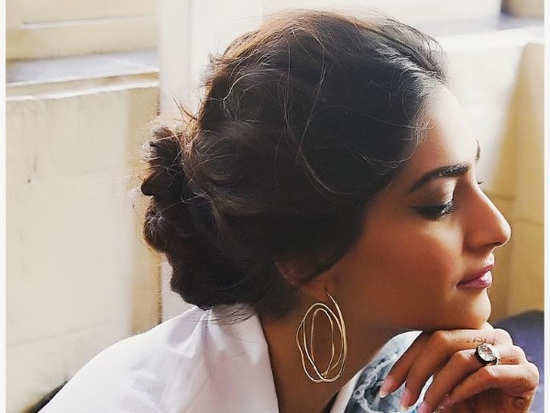 Take cues from the likes of Sonam Kapoor Ahuja and Bella Hadid among many more, on how to style the hoop! Here's how Salman Khan's look for 'Race 3' was created! 2Here's how Salman Khan's look for 'Race 3' was created! 3Ace designer Ashley Rebello designs an outfit for Salman Khan this Eid! 4Priyanka Chopra just styled one top in 2 crazily different ways and no one even noticed! 5Priyanka Chopra's Jacquemus skirt is headline news itself! 6Kylie Jenner and Kim Kardashian West look like twins in matching skintight leggings! 7Did you'll notice how perfectly Anushka Sharma and Virat Kohli complemented each other's athleisure style? 8All the details we're loving about Priyanka Chopra's latest look! 10This diamond-encrusted Hermes Birkin might break the record for the most money paid for a handbag!